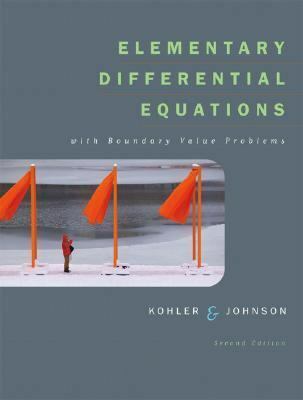 by Kohler, Werner E., Johnson, Lee W.
Kohler, Werner E., Johnson, Lee W.
Elementary Differential Equations with Boundary Value Problems integrates the underlying theory, the solution procedures, and the numerical/computational aspects of differential equations in a seamless way. For example, whenever a new type of problem is introduced (such as first-order equations, higher-order equations, systems of differential equations, etc.) the text begins with the basic existence-uniqueness theory. This provides the student the necessary framework to understand and solve differential equations. Theory is presented as simply as possible with an emphasis on how to use it. The Table of Contents is comprehensive and allows flexibility for instructors.Kohler, Werner E. is the author of 'Elementary Differential Equations With Boundary Value Problems ', published 2005 under ISBN 9780321398505 and ISBN 0321398505. Loading marketplace prices 10 copies from $52.32 How does the rental process work?